Iran says the US has “crossed a red line” by imposing sanctions on the head of its judiciary, Ayatollah Sadeq Amoli-Larijani. The foreign ministry vowed to retaliate but did not say what form any action might take. Iran also rejected any changes to its nuclear deal with world powers. US President Donald Trump, a critic of the 2015 accord to prevent Iran developing nuclear arms, said he would extend sanctions relief one last time. However, the US imposed fresh sanctions on 14 individuals and entities over alleged human rights abuses. President Trump said he was giving Europe and the US “a last chance” to fix “terrible flaws” in the nuclear agreement signed by Iran and six world powers in 2015. The White House wants EU signatories to agree permanent restrictions on Iran’s uranium enrichment. Under the current deal they are set to expire in 2025. Mr Trump also wants Iran’s ballistic missile programme to be addressed. Although the US has suspended sanctions against Iran following the nuclear deal, it still imposes punitive measures over issues such as terrorism, human rights and ballistic missile development. The US Treasury issued a statement on Friday saying Ayatollah Amoli-Larijani was responsible for the “torture or cruel, inhumane, and degrading treatment or punishment of prisoners in Iran, including amputations”. It froze any assets he and the other individuals and entities on the list hold in the US, and “generally prohibited” Americans from engaging in transactions with them. Foreign financial institutions or individuals could also face sanctions for doing business with those blacklisted, the US Treasury added. 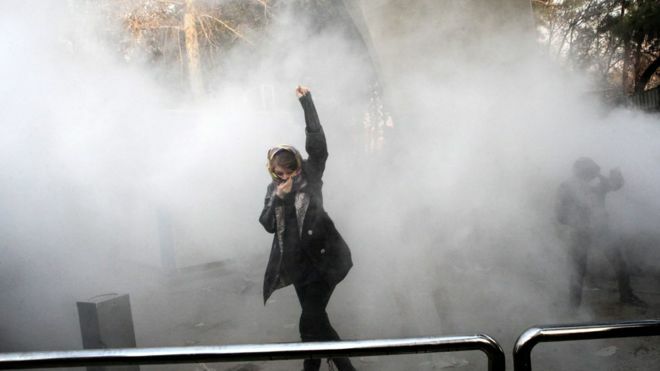 The head of the Iranian judiciary had called for a crackdown on “rioters” and “vandals” following a recent spate of anti-government protests in Iranian cities. Iran has complained that US sanctions not connected to nuclear activity have effectively cancelled out any financial benefits it expected from the 2015 deal. How else did Iran react? Iran’s foreign ministry accused Mr Trump of “continuing to take hostile measures against the Iranian people and repeating the threats that have failed many times”. Iran, it said, would not accept any amendments to the nuclear deal “now or in the future” or allow any other issues to be linked to it. Foreign Minister Mohammad Javad Zarif accused the US of making a “desperate attempt” to undermine a “solid” deal. The accord signed between six global powers and Iran saw Iran agree to reduce uranium enrichment activity drastically, dispose of its enriched uranium stocks and modify a heavy water facility so it could not produce material suitable for a nuclear bomb. In return, decades of international and US nuclear-related sanctions were suspended. As part of an agreement with Congress, the president has to sign a waiver suspending the sanctions every 120 days. Mr Trump has repeatedly criticised the deal – reached under his predecessor Barack Obama – as “the worst ever”. The waiver he will sign suspends sanctions for another 120 days but he warned that if a new agreement was not made, sanctions would not be waived again. “If at any time I judge that such an agreement is not within reach, I will withdraw from the deal immediately,” he said. US officials say the president will work with European partners to try to broker an agreement limiting Iran’s ballistic missile activities. He was prepared to back a modification to the existing deal if it were made permanent, one official said. The president also wants the US Congress to amend a law on US participation in the nuclear deal, so that Washington can reimpose all sanctions if Iran breaches certain “trigger points”. This would involve negotiations between the US and its European allies rather than talks with Iran, the official said. Russia’s Deputy Foreign Minister, Sergei Ryabkov, described Mr Trump’s comments as “extremely negative”. Germany has said it will continue to call for the deal’s full implementation and will consult on a “common way forward” with the UK and France. French President Emmanuel Macron phoned Mr Trump on Thursday to call for “the strict application of the deal and the importance of all the signatories to respect it”.